Air travel in India is growing by every passing day. The total number of passengers who travelled by air domestically or internationally rose by more than 2.5 times during the last decade from 7.16 crore in fiscal year (FY) 2007/08 to 18.39 crore in FY 2017/18. With air travel becoming common, the facilities offered around air travel are also being accessed by increasing number of people. A facility which is highly sought after by majority of frequent travellers is airport lounge access. And what could be better if it comes free with your debit card! The facilities offered at these lounges may include food and beverages, access to phone, fax, internet, conference room, sleeping pods, and rest rooms in the lounge area. It is not uncommon for these travellers to go through longer waiting period at airports mostly during connecting flights, take-off time at odd hours or flight delays. In such a situation, airport lounges offer a great degree of convenience to spend time, take rest and freshen up. To tap this growing segment of air travellers, many banks have come up with debit cards that offer complimentary lounge access to their subscribers completely free of cost. Not all cards have similar offers when it comes to lounge access. The most critical feature to look into these cards is accessibility based on your travel pattern. Some cards may offer only domestic access which may suit to domestic travellers. 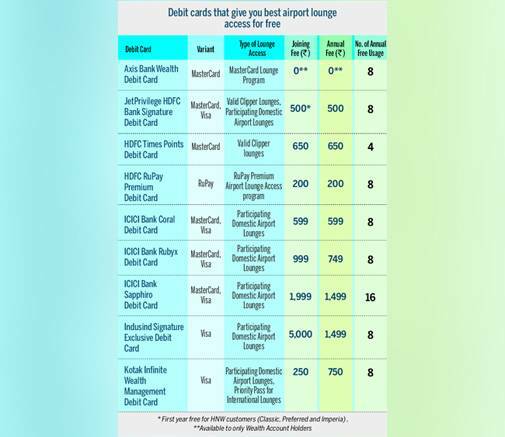 Before selecting a card, you should check the details of all the domestic airports where you would get the lounge access and whether it suits your travel. If you are a frequent air traveller, you can find for yourself a debit card with one of best complimentary lounge access features. Lounge access is provided only to members and this membership comes with annual membership fee. For instance, for a Standard Priority Pass the annual membership fee is $99. So when some debit card offers complimentary access, what they mean is that you do not have to pay the annual membership fee. However, the lounges also charge usage fee each time you visit the lounge. There are only select debit cards which do not charge even the usage fee. If you are looking for completely free lounge access, then most of the cards offer limited access like one to four free accesses each quarter. Under the free access service of Priority Pass by MasterCard you would be charged an authorisation fee of Rs 25 for card validation which is later reversed. Visa card is charged Rs 2 for such validation. Besides the airport lounge access, these debit cards also offer other value propositions which may appeal to different segment of users. Therefore it makes sense for you to consider a debit card on overall value propositions that it brings to you.